Some Louisiana nurses thanked local police for their service with “kisses for cops” – apparently just baskets of Hershey’s Kisses. But ideally nurses would avoid linking their profession with romantic imagery. 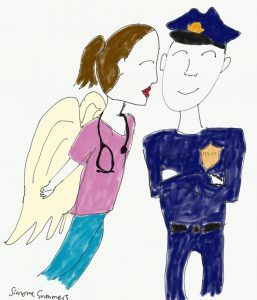 November 25, 2015 – Today The Town Talk, a Gannett publication in Louisiana, ran a short piece by Leigh Guidry headlined “Rapides nurses deliver ‘kisses for cops’.” The item described an effort by some nurses at Rapides Regional Medical Center to thank local police for their work by giving them baskets of Hershey’s Kisses—“kisses for cops.” The effort was reportedly led by Day Surgery nurses Jana Bordelon and Elizabeth Brossett, who delivered the baskets, with large signed posters noting that the hospital is “thankful for you,” on the day before Thanksgiving, in light of what the piece describes as “‘so many tragedies’ involving police across the country.” Alexandria Police Department Chief Loren Lampert expresses his appreciation: “In a time when people are so quick to criticize, it shows that for the most part people understand everyone just wants to do the right thing.” Bordelon, married to a retired state trooper, explains: “We just want them to know we’re grateful for them keeping our communities safe.” The political aspects of this are not our concern, but the nursing is, and we are uneasy about the “kisses for cops” theme because of the image of nurses bestowing “kisses” in their professional role. We assume what the police actually received here was just candy, and we see no sign of the classic “naughty nurse” stereotype. A bit of the virtuous “angel” image is arguably present in Brossett’s statement that the nurses wanted the police to know “they are being prayed for” and Bordelon’s note that the project itself is an angelic act and was a result of the nurses’ “counting our blessings.” (That “naughty angel” combination is rare, although we did see it in the 2009 series premiere of TNT’s HawthoRNe, when nurse Candy nobly granted sexual favors to wounded veterans.) In any case, nursing has been undermined for decades by the idea that at least part of nurses’ job is to provide romantic or sexual services. So the notion of a group of nurses providing any type of kisses to a group of police officers is still unfortunate. The “kisses” idea also raises other gender issues (e.g., are male nurses giving kisses to female police officers?). It may be too much to expect a media entity to be sensitive to these problems in a report like this, but we hope the Rapides nurses themselves will avoid romantic imagery in future thank you efforts. This should be the image of our cops or police, not those being accused of domestic violence and shootings.